Over the last year, I’ve joined the mailing lists of at least 7 or 8 nonprofit organizations. I was interested in many of the programs and mission statements, and I wanted to learn more about a few others. Gradually, the emails started trickling in. It wasn’t only until recently that I realized I was hearing from only 2 or 3 of them regularly. This baffled me. For the few nonprofits that have been sending me consistent newsletters, they remain top of mind when I think of nonprofits I’d be inclined to support. I don’t even remember some of the others I subscribed to, to be honest. 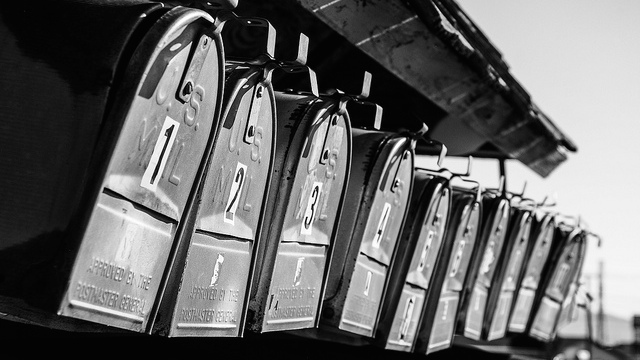 In addition to your campaign emails and fundraising appeals, your newsletter is a mainstay of communications between your nonprofit and its supporters. It helps drive traffic to your website, reels in potential fundraisers, and keeps your supporters engaged with your cause whether or not you have an event or campaign going on. And while you can include the occasional ask in your message, a periodic newsletter is a great way to simply keep supporters updated on what’s happening at your nonprofit. Just like any other relationship, this regular correspondence keeps the conversation going between you and your supporters. It communicates that you value their involvement in your community and cause. If you aren’t investing in your newsletter, it might be to time consider doing so. According to the Content Marketing Institute, the majority of the most effective nonprofit professionals (85%) consider e-newsletters an effective content marketing tactic; only 35% of their least effective peers agree. The wise nonprofit marketer knows that a newsletter, when utilized effectively and regularly, can be a great tool to strengthen donor engagement and communications. So you’re churning out a newsletter. But how often should you send it out? Many nonprofits may cut back on the frequency of their newsletters because they’re afraid of spamming subscribers, or that supporters will get annoyed by the influx of emails and unsubscribe from the email list altogether. This is an understandable concern, but it may be unwarranted. After analyzing participants’ email churn rates, the 2014 M+R Benchmarks Study found that unsubscribe rates drop as nonprofits send more emails (obviously within reason). Contrary to popular belief, delivering a lot of messages won’t necessarily drive people out of your email list. Consistent, relevant emails just might keep them on there. Supporters won’t remember opting into your email list. If you take too long to contact your subscribers, they may forget that they signed up in the first place. You don’t want to risk subscribers hitting the spam button after suddenly receiving a “random” newsletter. Email addresses will change and result in hard bounces. According to one digital marketing firm, 17% of Americans create a new email address every 6 months, and 30% of subscribers change email addresses every year. If your email bounce rates are high, you probably have an old, stale list. Fail to keep in touch with subscribers regularly, and they may not re-subscribe to your email list. Supporters will be disappointed in your lack of communication. Research has found that 53% of donors leave an organization because of its lack of effective communication. If you don’t engage your donors on a regular basis, you run the risk of losing their support. Remember that supporters sign up for your newsletter because they want to be kept in the loop. The longer you take to connect with them, the likelier it is that they will lose interest in your organization – or worse, abandon your email list and its appeals. We’ve covered the importance of sending out your newsletter regularly. Now let’s dive deeper into a few best practices for scheduling and tailoring your newsletter. Let’s address that timing question now. Should you send it once per month, twice per month, once per week, or once per quarter? Unfortunately, there’s no single right answer. This is entirely up to you, and the answer can vary with every organization. But as far as suggestions go, try sending a newsletter at least once a month. Once every two weeks will also keep you top of mind, without annoying your supporters. Keep track of your open, click, and bounce rates to see what schedule works best for you. Another factor that will affect your email frequency is whether you’ve set particular expectations with your supporters. If you want people to sign up for a regular newsletter, it might be helpful to establish up front how often they can expect a message from you. Once you’ve established your frequency, stick to it. If you decide to change it at anytime down the road, make sure to communicate that to your subscribers. This way, they won’t be confused if they notice any changes. According to MailChimp, a leading email marketing service, more emails are sent (and opened) during the weekdays than on the weekends. Tuesday, Wednesday, and Thursday seem to have the highest open rate. Also, more subscribers tend to open email after 12 PM, with peak hours being 2-5 PM. Of course, optimal delivery for your donors’ habits is up to you. Be sure to test delivery dates and times to chisel out the best sending schedule for your organization. MailChimp also finds that subscribers are most engaged immediately after they sign up. After they subscribe to your newsletter, be sure to send them an email to begin the relationship right away. Acknowledge them and thank them for signing up before their interest has a chance to wane. I received this email a few minutes after I signed up for their mailing list, and it totally made my day. First off, the celebratory image instantly showed their excitement for my support. 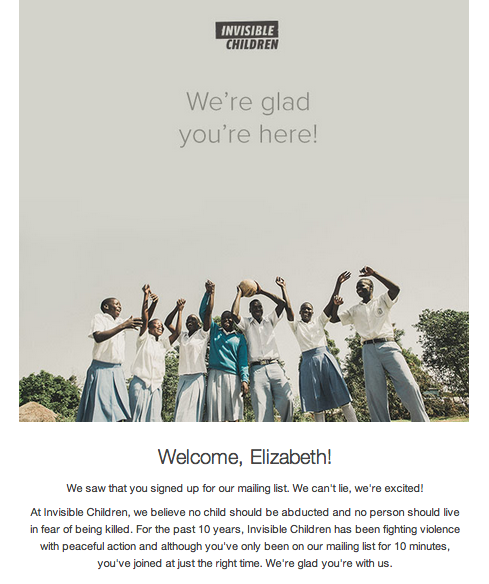 Even though it’s a preliminary email, the personalized copy welcomes me into their story and mission (“At Invisible Children, we believe…”, “We’re glad you’re with us”) and validates the importance of my support by saying I’ve “joined at just the right time.” Overall, they sound pretty excited they have my support, and it makes me feel good about it too. While it’s easy to send the generic “Thank you for joining our mailing list,” an email with more personality can go a long way in deepening your subscriber’s connection to your mission. It demonstrates your effort to send a meaningful message specific to a supporter’s needs and history. After analyzing a handful of organizations, M+R associates found that email subscribers may donate up to two or three times more online revenue through non-email channels (through search, social media, or the nonprofit’s website). Even if supporters aren’t donating by directly clicking through your email, it can act as a gateway to other avenues in which donors would like to be engaged. Make sure to include social share buttons and action items in your newsletter, such as clear links to your social pages, blog, and website. Don’t underestimate the power of your newsletter. If you send it out consistently, it can be a powerful content marketing tool that keeps your supporters engaged with your mission. Test, test, and test some more to find the best delivery schedule that works for you and your unique supporters. With some tailoring, newsletters can be huge assets to your organization!